The challenges of cycle touring continued for the last few days of our little tour, testing our resolve and our stamina. We left Southwold and wound our way up from sea level and along country lanes heading towards Thetford Forest again. Didn't get to go along the same lovely roads we had done the previous week, but it was pretty good cycling. We even had a lovely truck driver hold back to allow the truck behind us to pass us safely and then give us a massive cheesy grin and a thumbs up. We arrived at Everetts Farm campsite near Foulden in good time, set up the tent and then squeezed into a single shower as we only had one 50pence piece required for said showers and with the timer ticking down from 6 minutes we lathered and rinsed as fast as we could! The next morning we awoke to drizzle which turned into a downpour as we packed our stuff away and set off. As the rain eased and the sun tried to come out I got a puncture. We got it fixed up pretty promptly and continued a little wearily. Then the wind kicked in. Everyone talks about how flat this part of the country is, but they don't tell you that flat equals wind, lots of wind and that wind on a bike, if it is not a tailwind, can be much harder work than a hill. We had about 65 miles to get to the final campsite of the trip and the only decent sized town we were going to pass through was Wisbech where we planned to have lunch. Normally we'd been stopping for lunch after about 40 miles so we only had the last 20 miles to do on full tummies, but Wisbech was about 25 miles in so we still had the bulk of the ride to get through after our Morrisons Cafe lunch, but at least it dried us off and warmed us up after our damp start. The next 40 miles were accompanied by a constant headwind or occasionally a gusting side wind which zapped our energy, caused our arms and hands to hurt from gripping the handlebars so tightly and dried our mouths out. It was slow, hard going and soon enough our water bottles were almost empty. There was nothing but farmland and no obvious source of more water. Thirst is horrible and I'd started eyeing up puddles, but then we came across a hand car wash and got our bottles refilled by the kind workers there. Sadly we still had to endure hours more of cycling into the headwind. We got grumpy, we got tired and while we didn’t have a falling out, we didn’t have our best times. Still we made it to the campsite in the quaint village of Folkingham. It was a great campsite and after a well-earned dinner of Stag chilli and rice we headed to the local pub for a couple of drinks and the chance to recharge our phones. The following morning we awoke to sunshine and got packed up in good time, we were just about to mount up when Tom noticed he had a puncture. We unloaded Tom’s bike and had to fix an inner tube before being able to get going. 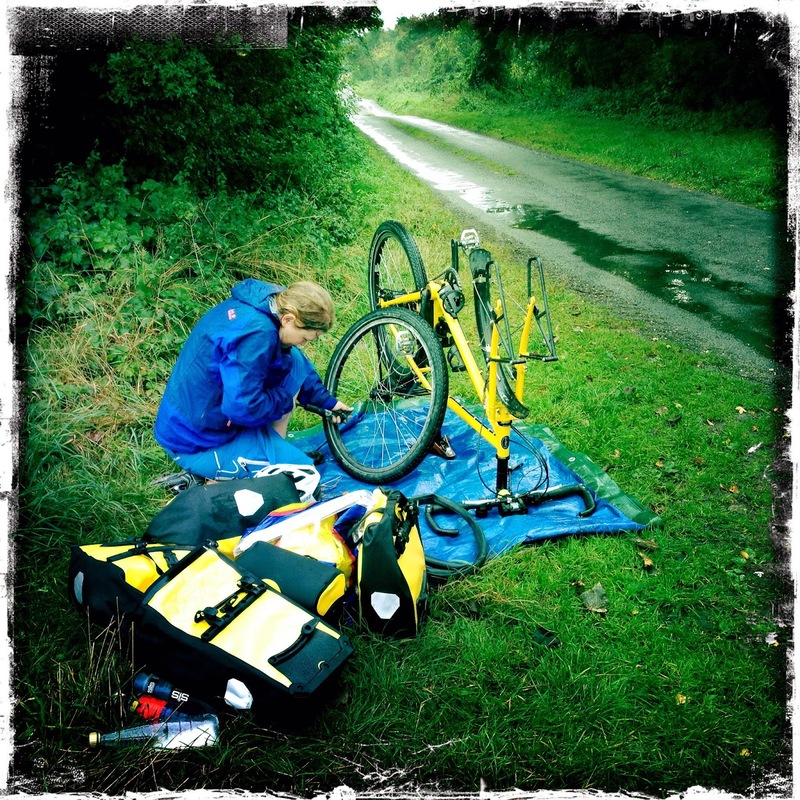 Then only a couple of miles out of Folkingham he had another puncture. We’d obviously done a bad job of fixing the inner tube so we sat at the side of the road patched up all 3 inner tubes and used the best looking one for Tom’s wheel. We had a headwind again and our legs were a bit heavy after the previous day’s endeavours, but we only had 27 miles to Lincoln. We’d planned to get to this lovely city we’d heard lots of good things about and then have a look around, but by the time we got in we just wanted to get on the train and get home.